Small evergreen tree, native to China and Japan, member of the family Podocarpaceae (Taxaceae). 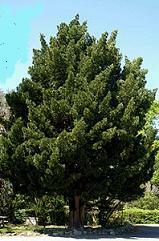 Some of the common names such as Buddhist Pine and Yew Pine are misnomers, as Podocarpus is not a pine, but closely related to Cephalotaxus and Torreya. The trees reach a height of about 30ft with thick leathery leaves and small nondescript yellow blooms which mature into seed bearing cones. P.macrophylla is highly regarded as a specimen or hedge tree with low sloping branches and a natural broad conical shape. They are suitable for warm weather climates and prefer a well drained loamy soil. The trees are monoicious (trees are either male or female). The female blooms are peculiar in that the upper part of the stalk fuses with a single sterile scale in the flower and forms a brightly colored receptacle in which the seed is produced. The receptacle is edible as is the atil which surrounds the seed. Trees do well in low light areas and in small spaces. The trees are easily propagated by layering, softwood cuttings or sowing seed, which seems to produce the longer lived seedlings. Seeds should be sown as soon as they are ripe in a light mix of sand, compost and peat. Stored seed should be cold stratified for 90 days prior to sowing for best germination. Cuttings should be taken from soft wood and rooted in a combination of sand and peat, kept moist and covered until rooting. Lower branches of existing trees can also be layered and allowed to root. P.macrophylla has also been called a Buddhist Pine and is hgihly valued in Japan and is considered a feng shui tree. Hardy to 20F (-12.2C) Height: 45ft Spread: 25ft.